This past weekend in Barcelona the city took off work and school from Friday to Monday for the annual La Mercè festival. This has been an official Catalonian holiday since 1871, when Barcelona’s government first organized festival of many special opportunities to honor the Roman Catholic feast day of La Mare de Déu de la Mercè, which translates to their Lady of Mercy. The entire city shuts down, you can only find restaurants, touristy shops, and mostly only stores located in the touristy locations are open. The festival does not only happen in one central location, there are many locations throughout Barcelona with events for all ages young and old. We were able to walk if it was a nice day or even take the metro to the different locations. 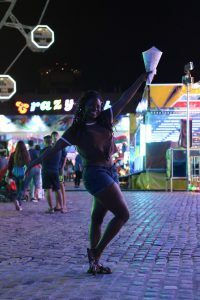 Some of the events included a huge fair along the beach complete with rides, games, food vendors, homemade goods, and prizes. There were also many tents throughout the city near the events with homemade goods both material and edible, from candies, to fresh juices, jewelry, bags, clothing, and more. There were also concerts every day with singers, dancers, and musicians. Locations for children to play, activities for them, puppet shows, and animals. There were also parades almost every day! The events would start as early in the morning as 7 or 9 am, and would go until midnight and sometimes later! There was always something fun to do. One of our favorite events was the Castellers, or human towers. 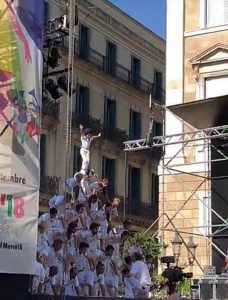 This is a Catalonian tradition that they do for almost all of their major celebrations and holidays, we saw smaller versions of this at the Catalonia Day parade a few weeks ago but the ones this weekend were incredible in comparison. They did towers of almost 10 layers of people high and one or two tiny children would climb to the top of each one to complete it. It was amazing to see these groups carry out such a skillful performance coordinated to chants and music. The streets were packed with both tourists and locals that wanted to take in this wonderful tradition. It was definitely worth seeing. 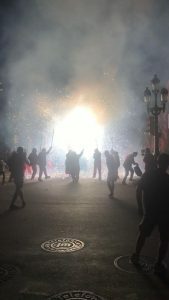 The Correfoc parade was something that at first when we heard about it, we were all terrified and weren’t sure if we wanted to go, but in the end it was my entire group’s #1 favorite part of the entire festival. Correfoc translates to Fire-Run in English, which I bet already sounds scary! In Barcelona, they close off an entire street and a roundabout for this parade. In the Roundabout, many groups from various churches around Barcelona with participants of all ages play drums and wear amazing costumes that all centered around a Devilish theme. They gather behind a massive, building sized set of doors where a fire, sparks, and fireworks show takes place as the Correfoc opening event. Once this beautiful show ends, the doors open and the groups travel through the doors and down the streets ini a parade like fashion spraying sparks into the crowds! 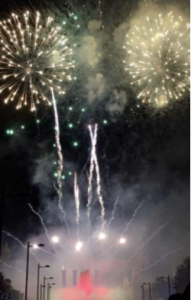 They use handheld spark throwers or even animal floats that spray the crowd with larger amounts of sparks. They travel down a long street playing drums and spraying the sparks at the crowds while people either watch from the sides or run through the streets directly into the sparks. We were scared at first to get involved, but we saw how much fun people were having so we decided to join in and it was the best decision ever. For hours people danced and sang in the streets with sparks literally flying everywhere. It sounds a lot more dangerous than it is, while they are literally spraying you with sparks, they warn people to wear long clothing and possibly glasses/bandanas to cover your face, however we even saw people dressed in regular clothing dancing in the streets and no one seemed to get hurt! It was so much fun. One of the many Correfoc firework throwing groups! The closing ceremony was a fireworks and fountain light show choreographed to go along with an orchestra of music and it was the most beautiful thing we had ever seen. This fireworks show dare I say gave America’s Independence Day fireworks a run for its money! Many people in the crowd had mini sparklers to wave while they sang along with the music, and all you could see was a sea of lights under this wonderful display. It was truly an amazing sight. I would recommend everyone comes to the La Mercè festival at least once. I have never seen a city come together quite like this to celebrate for 4 days and not just in one central area but literally all across the city. If you can, definitely check it out at least once! I hope to come again some day. The finale fireworks show that closed out La Mercé 2018! Hi again everyone! So I have been in Barcelona for about 2 weeks and it has been great so far! 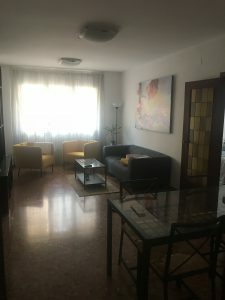 My program CAPA has provided me with an apartment a few metro stops away from Catalunya (which is like Barcelona’s downtown) and a free unlimited metro card to get around the city. I have 4 housemates who are all from different schools, and two of the girls are actually from New England like I am. Our apartment has a large living room, 2 bathrooms, a full kitchen, and 4 bedrooms. We also have a balcony where our washing machine and clothesline are located. Thats right CLOTHES LINE, dryer machines are not popular in Spain. There are only 8 people in my program which was very unexpected and bothersome at first to all of us. However, we have found that the small group has made it easy for us to bond and explore the city together. All of our classes are held at the CAPA center, located right in the middle of Catalunya. We have professors from different places in Europe, most of them are from Spain but we do have others from places like Italy and the UK, so we are experiencing many different teaching styles and techniques. My bedroom, I was lucky enough to get a single! 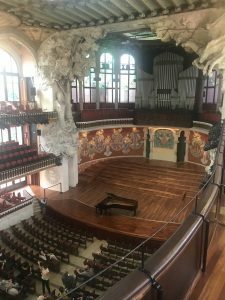 The main stage at Palau de la Musica! Balcony Seating and the stained glass ceiling at Palau de la Musica! 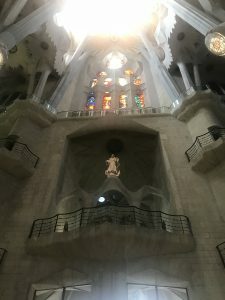 We also visited the word famous Sagrada Familia, the unfinished Roman Catholic church designed by none other than Antoni Gaudi. It was truly a beautiful experience. Outside view of the Sagrada Familia! Stained glass windows inside the Sagrada Familia! 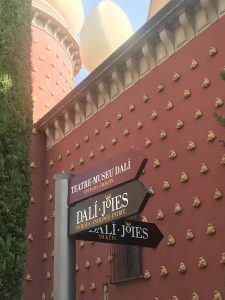 The trips we were provided with so far, have been to Figueres to visit the Dali Theatre and Museum. Me standing in front of many of the beautiful art pieces inside of the Dali Museum! 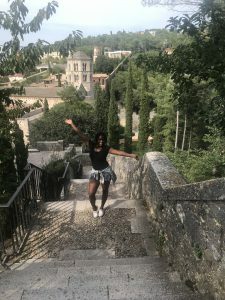 We also went on a day trip to Girona, where we did a walking tour through the streets to many different beautiful locations, famous churches, gardens, and even the filming location of one of the Game of Thrones Seasons! On both trips we had an amazing and knowledgeable tour guide. 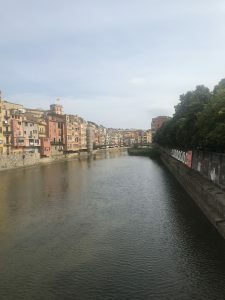 A huge river that flows through Girona! There is always something to do in Barcelona, both all day and all night (but NOT on Sundays. These are rest days and EVERYTHING is closed). There are so many different yummy restaurants, and if you love seafood Barcelona is the perfect place for you! Nightlife lasts well into the morning here, and the weather is much like that of California with beautiful beaches for you to enjoy the sunshine and palm trees. Like I said before, I have only been here for 2 weeks and I am already falling in love with this city. Thanks for reading! 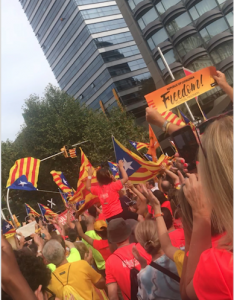 Our view from the middle of a crowd of almost a million people cheering during the Catalonia Day Parade! Hi guys! I am so happy you’re interested in my journey abroad and can’t wait to share my experience with you! Before I get to my destination, I wanted to give you all a little background on how this was all made possible. 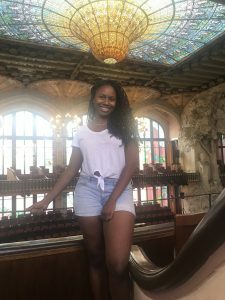 I chose to do my final semester of college abroad in Spain because I wanted to experience something new and different. 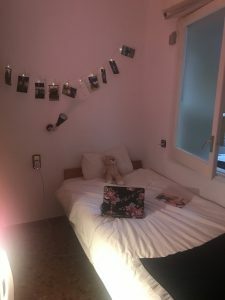 I chose my CAPA location because Barcelona has been a dream destination for me since a young age. I remember seeing this beautiful city as a child while watching ​The Cheetah Girls ​and thinking “I have to go there someday”. The beautiful scenery, unique foods, language and art were completely different from what I have experienced during other travels, and I knew I had to see them for myself. Unlike most people who study abroad, I hadn’t been preparing for this throughout college. I was involved in so many things on campus from sports to clubs that I never thought I would have the time. Studying abroad never crossed my mind until a good friend of mine returned from her semester away with CAPA in London. She told me about how much fun she had and how easy CAPA made it for her to take the classes she needed that I decided to take a huge risk and sign up for this program myself. The application process was pretty fast and I knew within a few weeks that I was accepted to CAPA and would be flying out at the end of the summer! My family and friends weren’t surprised at all at my decision, they know I have always loved traveling and jump at any opportunity I get to do so. I am most excited for the amount of exploration I will have the opportunity to do while in Barcelona. 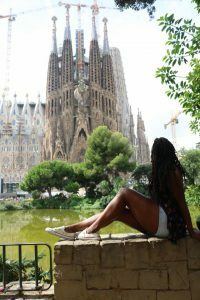 Friends of mine who have gone abroad to both Barcelona and other European countries have raved about how easy it is to not only explore the country I am residing in, but also some of the surrounding countries as well! 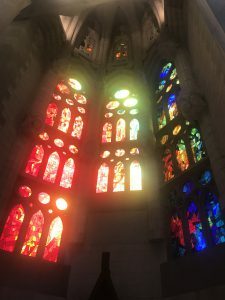 My own home town of Boston has many hidden gems within the city that people especially tourists do not know much about, therefore one of the biggest things I want to do while in Spain, is find what Barcelona’s hidden gems are. My biggest worry about studying abroad is being away from home for so long. The only experiences I have had that were remotely close to this were international trips I took in middle and high school, neither of which however were more than a few weeks long. Being away from my siblings, parents, boyfriend, and close friends I know will be a challenge ant homesickness is definitely not something I am looking forward to but one way I am preparing is thinking of small solutions I can implement while abroad, like making sure the people I am closest to have applications like Skype and Whatsapp for us to communicate on in addition to taking this opportunity to become more independent and enjoy my time away. I am not sure what my expectations are for this experience. I know that it will be a once in a lifetime opportunity full of growth, fun, and adventures. I can’t wait to board my plane in five days! 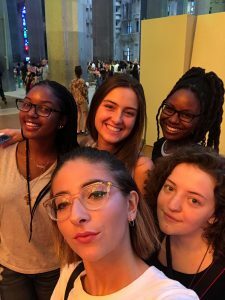 Follow this Fall 2018’s Office of Study Abroad & International Experiences Global Correspondent, Maya Crawford, on her studies in Barcelona, Spain! 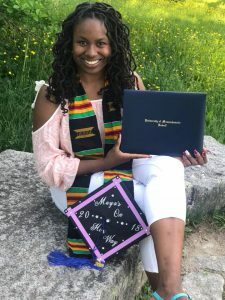 Maya is a UMass Lowell Business Administration major studying with UMass Lowell Partner Led: CAPA Global Cities: Study and Intern in Barcelona. 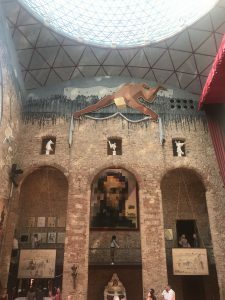 You can also read blogs from current and previous trips to Spain listed below or from other destinations across the globe UMass Lowell students travel to.